In researching Book of the Month I scoured kid authored blogs, talked with children I know along with with educators and parents and reached into my own memories from classroom teaching. 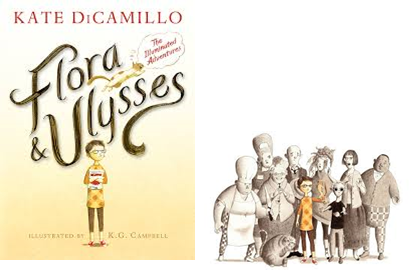 This month, in my quest to bring you books that that have left young readers talking I couldn’t ignore the buzz around Kate DiCamillo’s new book Flora and Ulysses. This book is mad cap magic meets realism and is eccentric with a capital E. Flora and Ulysses is a real genre blender, mixing super hero action, with family turmoil, social allegory and a touch of fantasy. While this may get a little crowded for adult readers, children have been coming away from this book with their eyes and hearts opened a bti wider by this tale of healing, hope and emotion. Flora is a likable character, a cynical girl with lessons to learn about love. A wild cast of characters including a magical squirrel, a nosy neighbor, a temporarily blind relative and more help Flora on a journey of discovery that readers will chuckle along with, as they turn the page urgently to keep up with and celebrate in the end.